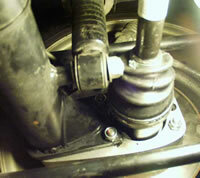 a current CV driveshaft supplied by Caterham. This is the new driveshaft as received from Caterham. It is identical to the ones shipped with their new cars. 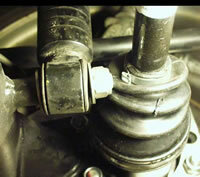 It is about 11mm longer than my old shaft..but Caterham said it would work fine on my car, a 1993 Dedion. 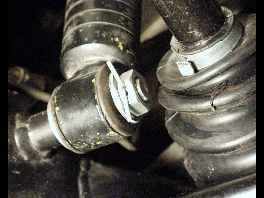 They do not supply the old driveshafts. It is obvious that if I move the car..or run like this..the boot will get torn up. Any help on this problem would be appreciated. Look at the design of the boot..then look below at the boot to the shaft on the other side of the car...which is stock from when the car was built. 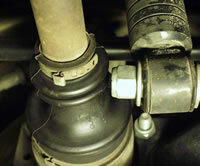 My problem was//..how can I move that boot outward so that it clears the bolt...or somehow get the clearance I needed. This is the other side...you can see the different style of boot...cut (molded) so that it clears the bolt.This type of boot and shaft is no longer available from Caterham. When started looking to replace this, I found the new shafts are 11mm longer. Caterham said there was enough "plunge" in the system.....this would work.